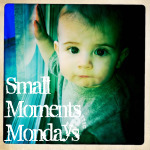 I have tremendous respect for this week’s Small Moments Mondays guest poster. Gigi, from Kludgy Mom, truly inspires me. Though she has a million things going on at any given moment, she does them all well…and with class. She is helpful and generous, driven and straight forward. I am always learning something from Gigi, whether it’s how to value myself as a blogger or how to keep my sense of humor. This piece took my breath away when I first read it and I have been so eager to share it with you. I could thank you a million times over, Gigi, and that still wouldn’t begin to cover my gratitude for sharing this story with us. I love the word, the idea that there is a space in the universe that is neither here nor there; the midpoint between two states of being; the crossing over place. The word swells with its own definition. Threshold: the crossing over point holds something: promise, loss, change, adventure, comfort. One must pass through to receive that which it holds. Boy Wonder was 3 years and 3 months old when he crossed one such threshold. It was is his first day of preschool. This wasn’t like any typical preschool. This was developmental preschool; a program to assist special needs kids. The school was about 8 miles away from our home. They wanted me to put my 3 year old who wasn’t potty trained and barely spoke a word onto a bus. They said it was the kids’ favorite part of the day. With much trepidation, we agreed to try it. Boy Wonder played outside in the rocks, Buzz Lightyear backpack on his back, while I stood at the curb, gazing far down the street, waiting for the bus’ arrival. The bus groaned and squealed as it came down the street. It looked like a monstrosity pulling up to our driveway. Metal scraped onto more metal. The bus driver was pulling back the weighty handle that opened the bus door. Whoooooooooooooooooosh. Air discharged from the mechanism as the folding door opened. The bus rumbled, sputtered, heaved with great noise; yet around me, a quiet void. Boy Wonder walked to the bus, his twinkling eyes growing wider at the sight. A moment of recognition that he was to get on, and then, a turn, backward, at me. I dropped to one knee, placed my hands on his shoulders, and looked into his eyes, the olive-like eyes that had only recently begun to look directly back into my own. We hugged. I turned him around by his shoulders, grabbed his hand and braced him as he stepped up onto the first stair of the bus. The bus monitor was at the top step, hand outreached to pull Boy Wonder onto the second step, and then the third. As he crossed over the threshold, Boy Wonder let go of my hand as he grabbed onto hers. The bus door screeched again shut. Whoooooooooooooooosh. Flash forward. The first day of kindergarten did not have the weighty fanfare of two years prior. No, I walked Boy Wonder through the automatic doors of the elementary school that day, settled into his classroom, and left the school excited for his new adventure. But one morning the following week, we arrived at the front door of the school. With a hushed whoooooooooooooosh, the automatic doors glided open. Boy Wonder stopped. Wooooooooooooooosh. The automatic doors glided shut. “Okay, buddy.” As I did two years prior, I dropped to one knee, looked him in his olive eyes, told him to have a good day and turned him to face the door. Woooooooooooooooosh. The automatic doors glided open. I stood up. Boy Wonder walked through the doors. Hope surrounded him. I looked at the doors, but was not able to see through them. Woooooooooooooooosh. The automatic doors glided open.There was Boy Wonder. He blew me a kiss, waved, turned and ran down the hall. I watched his backpack bounce rhythmically up and down as he ran. Wooooooooooooooooosh. The automatic doors glided shut. Our children, and we, grow in the small moments: the moments where they leave us on this side of the threshold. Now that you’ve read Gigi’s beautiful words here, please go read some of my favorite posts: The Man Who Braved the Cold, Waiting is the Hardest Part, Let’s Rename the Whoopie Pie. Okay, choosing those three was so incredibly tough. Why? Because not only is Gigi prolific, but she is consistently awesome. I could have easily pointed you to this, this, or this. You can also find Gigi over at She Posts, where she’s keeping us all up to date on what’s happening in the blogosphere. Please go like Gigi on Facebook (she has such an awesome landing page) and follow her on Twitter. I’m certain that you’ll love her as much as I do. Nichole, thank you for such a lovely introduction. It made me smile here right before bedtime :). I am honored to be guest posting at your blog today…your words consistently amaze and inspire me (see my little send-over to you today on KludgyMom…kind of a neat story you probably didn't know). Love Gigi & I love this post. It reminds me of the first day of school for each of my kids, but especially my first. In first grade, I thought I was going to have the whole week to walk him to his class. Not my kid. He stopped me on day 2 to tell me, “I have this mom. It’s fine. I love you.” I sat & watched my tiny little kid meander through his big hall and get lost with the crowd. I walked to my car with tears pouring down my face. 8 years later and I still remember that feeling like it was yesterday. Love this, Gigi. The letting go is really so hard. They are so, so little. Last week I took X to his first speech therapy appointment. It was drop-off. One hour. He let the woman take his hand and they walked away and the door shut behind them. And I had that moment of, "I'm glad he's not freaking out. Wait, WHY isn't he freaking out?" Every step away is, well, a step away. Oh Gigi….this is so very sweet and gripped my mommy heart. Each and every one of these steps is so hard and SO important for them….and how do WE make it through? Your words are beautiful, and what a perfect place for them to land. Great post, my friend. Gigi is amazing.There is nothing that she can't do and she does it all with style, grace and ease. This piece is beautiful and sad, as letting go always is.Thank you for sharing it with us. This was beautiful, Gigi! You described the feelings of letting go so beautifully. This got me all teary reading in bed. Such beautiful moments for you to share with us. R&C start preschool in the fall. I have a feeling I'm going to be happy and a wreck all at once. i am bawling my eyes out…what beautiful words for beautiful moments. I felt the pulling each time, you described it so beautifully. And threshold – few heavier words exist. Nichole, already loving and Following Gigi. Great choice, as always. Gigi, what a lovely post. Beautiful. Thank you. That bus. Oh, that bus. Thank you for putting it so perfectly. That bus means so much more than transportation, it does mean the beginning of a new life. Hard stuff, so beautifully expressed here. Gigi- this is a wonderful post! These moments are so very hard, and you both handled two major changes with grace. Bus and Kindergarten….always tough! I love her title! It is perfect. We will be crossing the thresold in the fall when JDaniel starts preschool. He will be ready and I will be in tears. That was so gorgeous Gigi. I watch the boys get bigger and grow and I wonder how much longer I really have them. You know??? That is why I let them come to me and sit on my lap and be with me, to forgo the dishes and sit with them..bask in them. What a gorgeous post!!! nicely done…I can see my boys and my grandson running with their packs bouncing on their backs…such a nice visual. Such a beautiful description, Gigi. You are quite capable of delicate and beautiful too! I love it and I hate it. It is so, so beautiful and perfectly written and the best analogy I've read about being a mom. And I hate it because it is true and I don't want to be trapped on the other side. I want to walk through and still be a part. Why can't they grow up and be little at the same time? What a lovely post. So after enough WHOOOOOOOOOSING of the sliding doors, did someone say, "Ummmmm, ma'am, we're going to need you to either come inside the building or leave – the doors have been constantly opening and shutting for the past 10 minutes."? This is just perfect. I can't believe you had such strength to put your little boy onto that bus. But they'd told you it would be his "favorite part of the day." And we mothers do what helps our children even when it hurts our hearts. So well done, Gigi. All of it. This is so sweet and bittersweet. I'm not ready to think about my kids getting on a school bus or going to school, but if I do let myself go there, just for a second, I imagine it will be just like this. Oh I love this so much. These damn thresholds just never stop though. ugh. Heartbreaking for a mom. I feel that whoosh every time I drop off my daughter at the sitter's. And it knocks the wind out of me. Being the big chicken that I am, I make the DH do it. Love Gigi and love seeing a more intimate view into her big heart! Thanks Nichole for featuring one of my favorite bloggers! Just this morning my son who's 2 wanted to pick out what he was wearing today…I won't lie…I had a moment. This was brilliant. Love Gigi. I remember Gigi's first blog. I love seeing these posts from her. Thank you, for the space here for Gigi, and for all of us, to get to see that she is more than just a blogging machine..she is Gigi. Oh how poignant, and what a great post! Yes, I dread these moments but yet it is in these moments that they show us that they're growing, learning, being a part of the fabric that we hope to someday weave alongside them, rather than for them. Wow. Wow. My heart hurts just a little bit. My sweet girl turns three on Friday. I've already heard my share of "No! All by myself!". Sigh… they grow too fast. What a beautiful post but so scary as I have two just about to start preschool. So bittersweet to watch them grow. This is so beautiful. My husband thinks I'm crazy because I'm sitting here crying. My little guy will start this fall, and I definitely have mixed feelings about it. Gigi is like the Oprah of the blog world!! This is such a beautiful post! "On this side of the threshold" Perfectly said…beautifully said. I love the two moments and how you see how much he has grown since preschool…that now he looks you in the eyes and kisses and waves good-bye…that just about made my heart burst. I can only imagine what it did to you. So wonderful to read this here Gigi. Ack! My son starts just two mornings of drop off preschool in four months, and it's starting to creep up on me. The thresholdiness of it. I've sent three beloved children off to school, felt pangs, been proud when they ran ahead of me into the school yard, the classroom. And I'm sure I will see him off, feel pangs, and be proud, but the threshold (and what a beautiful way of putting it) seems so much more significant with this son of mine. love this post. you describe the emotions involved with letting our children grow up with such intricacy. Beautiful. You know I have a tender spot for Boy Wonder since I think my little Dom is cut of the same cloth. He, too, has a Buzz backpack that I watch bob up and down as he walks to his class. He turns 3 this weekend, so this hit home. Those ARE such bittersweet moments for us parents. I still tear up sometimes when I see my 1st grader walking away from the car as I drop him at school. Lovely, heartfelt post. I love how you captured the essence of that moment as really not just a threshold moment for your child, but for you as well. Awesome! Letting go has to be the hardest part of parenthood and I am already dreading this day with Lucas. Gigi, I've not read writing like this from you before… I like it. Such a beautiful account of a moment that any mom can identify with on one level or another.